Peacock Hill is a suburban residential area in the Canterwood/Purdy area north of Gig Harbor. Located off Peacock Hill Ave NW, a main street in the area, the community has newer to brand new homes for sale and planned subdivisions with quiet, often dead-end streets perfect for families and anyone who wants a quick commute into Gig Harbor. Commuting north to Port Orchard, Bremerton, and the Naval Base Kitsap locations is also a short, 30 minute drive. Nearby parks include Crescent Lake County Park, Sehmel Homestead Park, and McCormick Forest Park. 3 Beds | 2.5 Baths | 1893 sq. Ft.
3 Beds | 2 Baths | 1176 sq. Ft.
3 Beds | 1.75 Baths | 1331 sq. Ft.
2 Beds | 2.5 Baths | 2332 sq. Ft.
5 Beds | 3.5 Baths | 4039 sq. Ft.
3 Beds | 2.5 Baths | 2302 sq. Ft.
2 Beds | 3 Baths | 2208 sq. 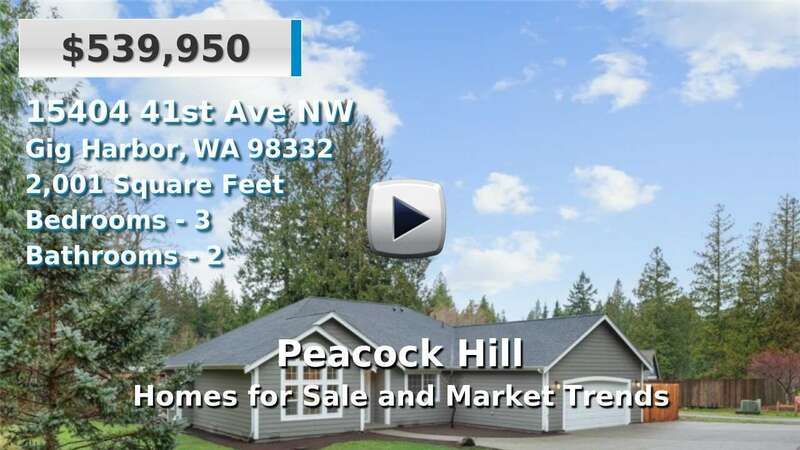 Ft.
Blue Summit Realty has the most accurate and up to date Peacock Hill real estate listings on the web. Currently there are 7 homes for sale, 1 condos for sale, in Peacock Hill. Of the 9 total Peacock Hill residential listings for sale 0 are bank owned, 0 are short sales, 0 are new construction, and 0 are townhomes. The price ranges from $395,000 to $0 with a median list price of $573,506 and median sold price of $535,301. Make sure to refine your Peacock Hill real estate search by property type, price, square footage, bedrooms, bathrooms and more with the search tool above or view the Peacock Hill listings on our interactive map. Our Peacock Hill real estate listings were updated 28 minutes ago.